Heavily armed Taliban militants in pickup trucks attacked a district headquarters Monday, killing three police, and four suspected suicide bombers on motorcycles were killed in a nearby city as the violence that has ravaged southern Afghanistan crept into the west. Two coalition soldiers, meanwhile, were seriously wounded in a suicide car bombing near Kandahar, and two Afghans working for the aid group World Vision were gunned down after delivering medicine to a town in Ghor province. The violence between resurgent Taliban-led rebels and Afghan and foreign troops came as NATO-led forces prepared to take over command of security operations in the hard-line militia's former southern heartland, a move that could lead to a reduction in the more than 21,000 U.S. troops in Afghanistan. The insurgents took their fight into the western Farah province, which has been largely spared from the violence that has claimed more than 800 lives, mostly militants, since mid-May — the bloodiest couple of months in Afghanistan since the military invasion that ousted the Taliban regime in late 2001. Hundreds of Taliban fighters drove into the town of Bakwa in about 35 pickup trucks late Sunday and launched a major assault on a district police and administration headquarters, firing machine guns and rocket-propelled grenade launchers, said Gen. Sayed Aga Saqib, the Farah police chief. The militants fled early Monday toward neighboring Helmand province after a five-hour clash, carrying an unknown number of militant casualties with them, he said. The clash left three police dead and seven wounded. Also in Farah, four suspected suicide attackers riding on two explosive-laden motorbikes were killed after they were challenged by police as they drove through the provincial capital late Sunday, Saqib said. Two of the suspected attackers were shot dead by police, while the other two were killed when police shot at their bike and detonated their explosives, Saqib said. A boy passer-by was also killed and his father wounded in the blast. In southern Kandahar province, a suicide car-bomber seriously wounded two U.S.-led coalition soldiers Monday when he struck their convoy in Daman district, on the main highway to Kabul, said Col. Tom Collins, a coalition spokesman. He declined to give the soldiers nationalities or identities. In western Ghor province, gunmen on Sunday killed a doctor and a driver for the aid agency World Vision as they were driving back to Chaghcharan from the town of Charsada, where they had delivered medicine, said Karimuddin Razazada, Ghor deputy governor. It wasn't immediately clear who was responsible for the attack. The upsurge in violence in Afghanistan has raised new concerns over the future of the war-battered country's fledgling democracy, instituted during the nearly five years since U.S.-led forces ousted the Taliban after the Sept. 11, 2001, attacks on America for hosting al Qaeda leader Osama bin Laden. The most intense fighting has been in the south, where NATO is bolstering its presence as it prepares to take over the security of the region from the U.S.-led coalition by the end of July. NATO is increasing its troop numbers in Afghanistan 16,000 from 9,700, which could allow the U.S. to withdraw several thousand troops from the country. It's one of the biggest and most dangerous missions in NATO's history, and has been met with stiff resistance from Taliban-led fighters who increasingly appear to adopt methods used by militants in Iraq, including suicide attacks. 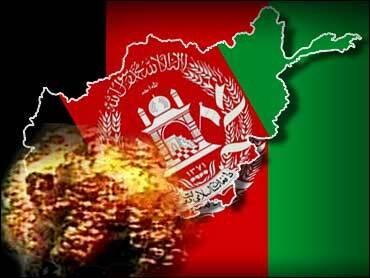 "It does not take much to train a suicide attacker," coalition spokesman Collins said of Monday's bombing in Kandahar. "All it takes is a warped mind and somebody who is willing to bet it all."